The legal team representing a man who was shot by Milwaukee police on August 31, 2017 is now speaking out on newly obtained body camera video of the incident. 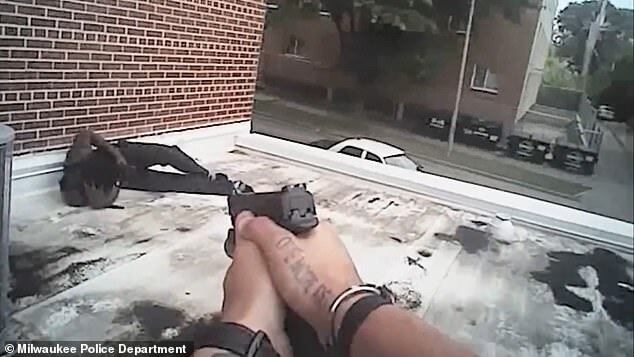 The newly-released body camera video shows officers jumping on the roof of a building approaching Jerry Smith Jr., then 19. Officers believed he was armed. Smith survived the shooting. He was unarmed. He was holding a cellphone to call his mom, according to the legal team representing him. "An unarmed man had committed no crime, no criminal history, no drugs and is getting on the ground with his fingers spread when the officer opened fire," said Daniel Storm, a forensic investigator who is working with Attorney Walter Stern. Stern is representing Smith in a civil rights case against the Milwaukee Police Department. "Lucky to be alive because the one bullet just grazed his head," Storm said. Storm is releasing the never-before-seen body camera video and additional documents from the Milwaukee County District Attorney's office to FOX6 News. According to Storm, the D.A. 's office has ruled the shooting was justified. Storm is now asking for another look at the case. "We're asking the U.S. Attorney's office to now look at this video, make an independent decision or recommend to District Attorney Chisholm to submit this to a grand jury," Storm said. The D.A. 's decision stems from statements made by the two identified officers. In his statement, Officer Melvin Finkley fired twice because he "perceived Mr. Smith was reaching for a weapon concealed behind the air conditioning unit." Meanwhile, Officer Adam Stahl heard the first shot but perceived it as (Smith) firing at Officer Finkley. He fired once because he "feared for Officer Finkley's safety and for his own." A total of three bullets struck Smith, causing serious injuries. "His right leg, he has partial use of it," Storm said. "We can only hope that the US attorney would get involved because we may have a violation of civil rights." Storm feels the results of this case are crucial. "The people in the community need to see that cops are as accountable as they are," Storm said. The officers were cleared of any criminal charges by the district attorney. The D.A. 's office has no comment on the request by Smith's legal team to involved the U.S. Attorney. "Right after the surgery, the only thing he could have was soup and Jell-O, things like that -- because they removed part of his intestines." "He just underwent six or seven weeks of antibiotics to his heart because he had three different infections at that time." "His right leg, he has partial use of it."